Come enjoy an authentic log cabin with acres of private land located just 8 minutes from Okemo mountain, 30 minute. Our home sleeps up to 8 guests on two floors with open floor plan. This newly restored home provides cozy cabin warmth with comfortable amenities. Get ready to sip your coffee with panoramic views of rolling Vermont hills without another home in sight. If you're not tired after a day of skiing or hiking, bring your cross country skis or sleds; our property is your playground. Our home is perfect for a ski trip or some time out of the city. A queen bedroom, oversized chair and desk with a view completes the master bedroom. A second upstairs bedroom boasts a queen size bed plus another daybed and trundle with brand-new memory foam mattresses. The downstairs bedroom includes a second daybed and trundle, ensuring comfortable sleeping spaces for all up to 8!! Two full bathrooms, washer dryer, and attached one-car garage makes this space feel just like home. 5 minutes to Ludlow downtown bars, shops, restaurants, groceries, etc..., 8 minutes to Okemo Mountain Ski Area and Nordic Center, 3 minutes to the famous Singletons General Store with smoked meats, VT cheeses, etc..., 40-45 minutes to both Killington and Stratton and under 30 minutes to Bromley ski mountian and Magic Ski mountain. You can access the wifi from anywhere in the house. Wifi Router is located in the living area right next to the Blue couch on the side table. If you want to plug in via Ethernet you can do so there. Our home is a SMART HOME!!! We have a touchscreen keypad lock for the front door off of the garage, which is the door that you should use primarily for entrance into the house. I will give you a lock code ahead of time and all you have to do is punch it in when you arrive and the deadbolt will open. The deadbolt is set to automatically lock behind you to maintain security in the house. So to exit you just turn the dead bolt open from the inside. We also have a NEST Thermostat located in the Kitchen, we will set it so that it should be warm when you arrive, but feel free to adjust to your comfort level by just turning the dial and also turn it down to 50 when you leave to help us conserve energy. Washer and Dryer are all stocked with detergent, they are located in the downstairs bathroom. Use as you please!!! We have everything you need to cook at the house, so feel free to do so and use our dishwasher, detergent under the sink. Along with some other household cleaners. Swiffer and Vacuum located in the Pantry closet off of the kitchen, feel free to use. Feel free to play with any of the games in the game room, if you decide to start a puzzle, please try your best to return all pieces to the right box, so that others guests can enjoy. I will be available by phone, call or text anytime!! Born and raised in Ludlow! Living and working in Boston now. 5 minutes to Ludlow downtown, 8 minutes to Okemo, 40-45 minutes to both Killington and Stratton and under 30 minutes to Bromley ski mountian and Magic Ski mountain. 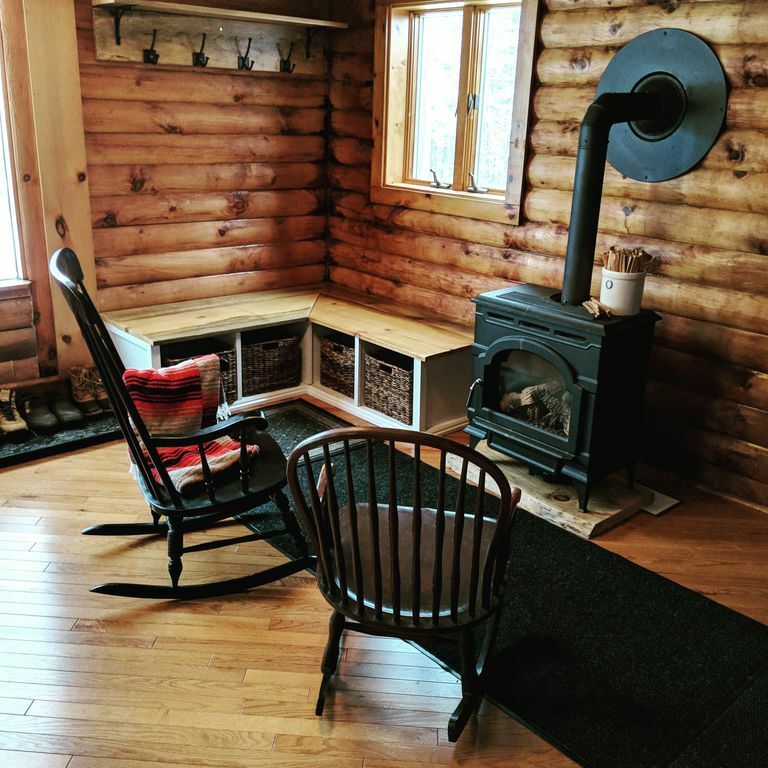 Enjoy acres of private space at the cabin that you can enjoy for privacy, cross country skiing, sledding, snowshoeing and more without even leaving the rental!!! Full kitchen for all your cooking needs. You will LOVE YOUR STAY!! We have Sling TV, Amazon Prime Video and Netflix!!! Property was better than advertised in a very quiet corner of Ludlow. Zach was easy to work with. Highly recommend a stay here. What a great weekend away! Beautiful views, clean and open house. This is a fabulous property, owner is responsive and answers questions quickly! Very Clean and inviting log cabin. Cabin has a great lay out and rustic feel with updated amenities. Comfortably slept 2 families- 4 adults and 4 kids. Owner is very responsive and on top of things. Would definitely stay again.